Magnified 1,600 times, a scanning electron micrograph of Clostridium perfringens captures a Gram-positive, rod-shaped bacterium forming endospores. 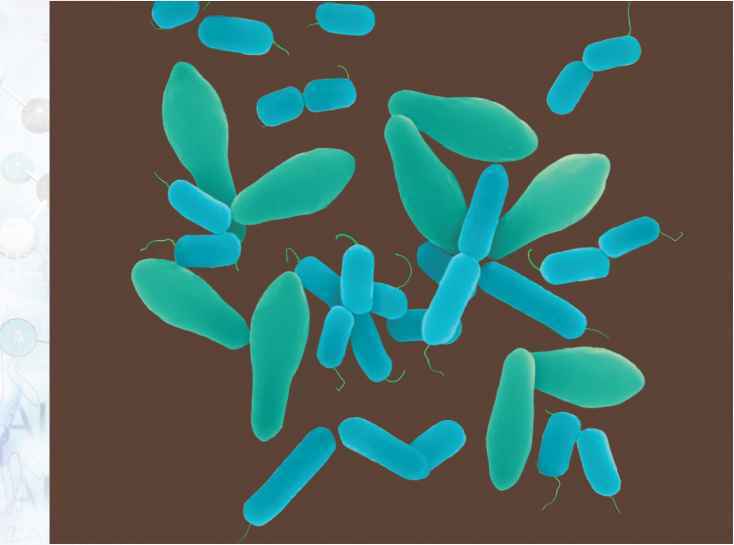 This bacterium causes food poisoning, wound infections, and gas gangrene. them from retaining a particular dye (called Gram stain) that is used to classify bacteria. Bacteria that have this LPS layer are called Gram-negative, in contrast to Gram-positive bacteria, which do not have an outer LPS layer and which do retain the stain. Of more importance to both the bacteria and the organisms they infect is that one portion of the LPS layer, called endo-toxin, is particularly toxic to humans and other mammals. Endotoxin is partly to blame for the damage done by infection from Salmonella and other Gramnegative species. Within the cell wall is the plasma membrane, which, like the eukary-otic plasma membrane, is a phospholipid bilayer studded with proteins. Embedded in the membrane and extending to the outside may be flagella, which are whiplike protein filaments. Powered by molecular motors at their base, these spin rapidly, propelling the bacterium through its environment. Within the plasma membrane is the bacterial cytoplasm. Unlike eukary-otes, bacteria do not have any membrane-bound organelles, such as mitochondria or chloroplasts. In fact, these two organelles are believed to have evolved from eubacteria that took up residence inside an ancestral eukaryote.